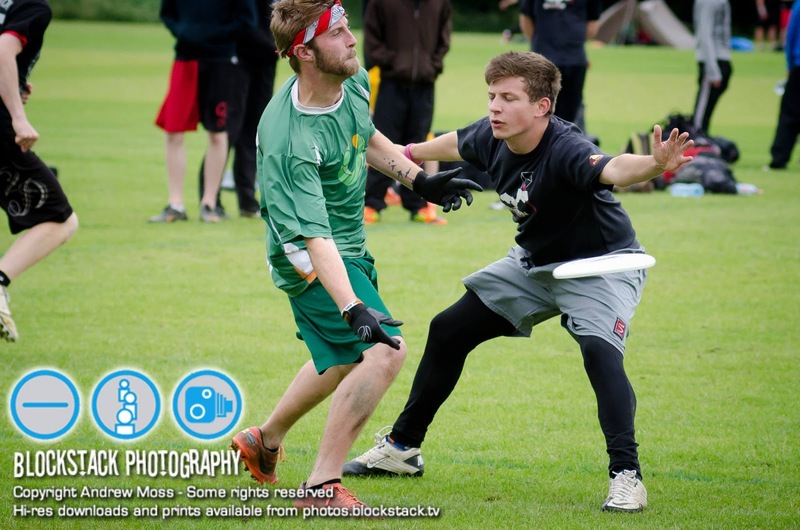 Matthew Parker from the ever rising Flump gives us his review of B tour at UKU OWT2. 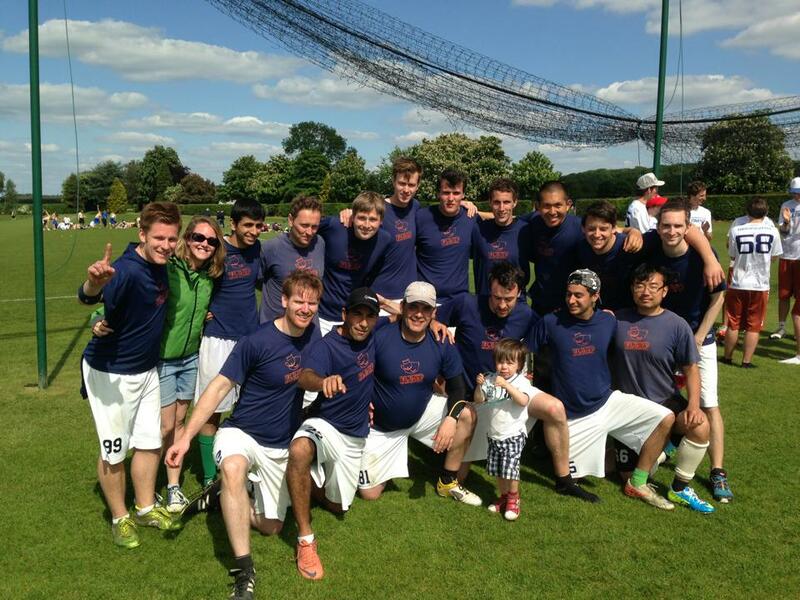 After the fantastic weather of London’s Calling, it was more than any self-respecting UK Ultimate player could ask for two tour weekends of good weather, and we were not disappointed. Winds hitting up to 20mph on Saturday, and even more on the Sunday, changed the dynamic of the ultimate, but still producing fantastic games all across B-tour. Owing to the events of the previous tour, teams were now seeded in closer groups, limiting each teams’ ability to rise and fall. The introduction of newly promoted C-tour team, Flump, into the top 8 and an opportunity to qualify into A-tour, sent rustlings of frustration through many seasoned B-tour teams. Furthermore, as a result of teams dropping out of A-tour and B-tour, ABH, Vision, and Bristol Open, who finished in the bottom 3 at London’s Calling, had another opportunity to hold their place in B-tour. Norwich’s Mustard, although being pipped to the final promotion place last tour, were given an opportunity to join Birmingham and Devon 2 in B-tour. Murray from Ireland U23 takes is forced by Reynolds from Brighton Echo. Photo courtesy of Andrew Moss. So the stage was set in a blustery Nottingham, with newly promoted teams attempting to cement themselves in B-tour, with many teams fighting to do the same and hopefully aim for the coveted A-tour spots being battled out by pools E and F. Saturday morning saw pools E and F play their first two games. Newly promoted Flump and Reading enjoyed their first games of the day with teams trading down-wind for the first few points of the game while they attempted to find their feet. Even though Flump saw the early break, Reading fought back and took the game 11-9. Simultaneously The Brown played the newly demoted Tooting Tigers on the crosswind pitches -The Brown put in a fantastic performance to dispatch the top seed 11-6. The subsequent games saw Tooting Tigers lose in a tight game with Reading 9-11, and Flump pip The Brown in an excellent game which saw fantastic plays by each side, including layouts, hammers, huge grabs, and ending with a single upwind break collected by Flump. The final games of Pool E saw an incredible game between Reading and The Brown, which traded upwind almost the entire game, with Reading drawing a small advantage midway, but The Brown pulling back in fantastic style in sudden death to take the game. The game between Tooting Tigers and Flump, saw the London rivals battle out a gritty match with more stoppages than an American Football game. Calls lasting a couple of minutes a piece as players discussed the events of the pitch – sometimes in raised tones – put a damper on the eventual Flump win. With so much at stake in each game at this stage in a tour, it is a testament to both teams’ spirit that in the huddle afterwards, a calm discussion took place between the captains to address some of the issues that had occurred. Each team looked to consider what had been said, and take those considerations into their coming games. Overall, this left Pool E in a confusing state, with The Brown, for the second tour in a row, losing out in a three way tie for the top two positions to Reading followed by Flump, who had proved their worth at the top of B-tour. Meanwhile, in Pool F, Ireland U23 were showing their colours, beating each team by at least 5 points. Jest Ridisculous 1 came second in the group, after losing to Ireland U23, but beating Emo 2 by a break, and only beating Brighton Echo in sudden death. The afternoon pools G and H saw newly promoted Devon 2 put out great performances against Mustard – winning by two points – as well as a massive win over ABH. However, Burro Electro, bemused at not being given the opportunity to fight for promotion, put in a great first day with a series of wins in their group. Newly promoted Birmingham saw an enjoyable first day in B tour, with wins over Bristol and Vision, however losing to GB U20s who confidently dispatched Bristol but lost to Vision (whom they beat by one in the final placement game). Sunday saw an increase in the wind and rain as only Nottingham can provide. 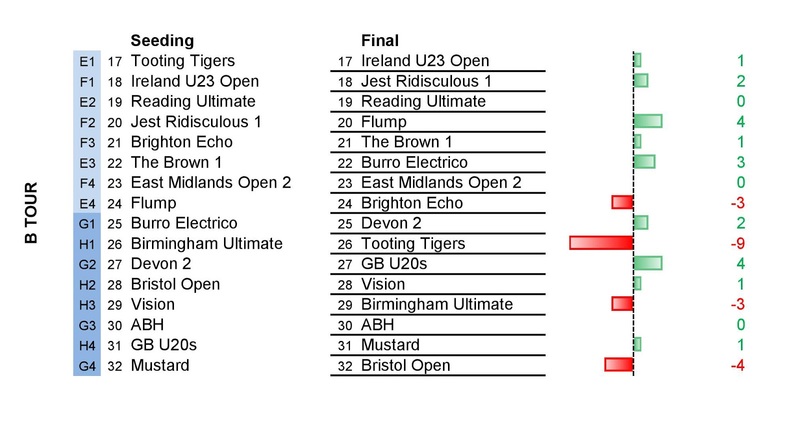 The first games of the day entertained crossovers in the middle eight, with EMO 2, Burro Electrico, Brighton Echo, and The Brown all cementing their place in the top half of B tour. The semi-finals saw Ireland U23 and Jest Ridisculous 1 play Flump and Reading respectively. In a hard-fought game, Ireland emerged as the deserved winners over Flump, managing to resist a heroic comeback in the cap. Despite being down at the half, Jest Ridisculous also pushed through in an exciting win against Reading, securing themselves a place in the final and a shot at A-tour, leaving old flames Reading and Flump to battle it out for the final qualification slot. The captain of Portland Rhino said in a recent Nationals campaign “The hardest thing to do in a tournament is beat the same team twice” [ED: see Chasing Sarasota], and Flump put a claim to that, as they immediately took a break and made Reading work for every downwind point. However, after working exceptionally hard into the wind, Reading managed to take down a dubious looking end-zone hammer and felt the turn of the tide. From there they pushed on to take the half, and finally the game in an A-tour worthy performance over Flump, who were prevented at being the first ever team to be promoted in consecutive tours. Ireland U23 finished off their fantastic tour with another win over Jest Ridisculous, and were crowned worthy winners of B-tour. we wish them all the best for their travels across the pond for World U23s next month. 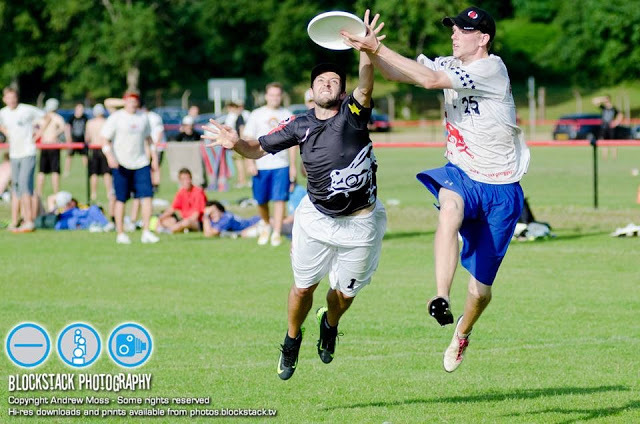 Elsewhere, Tooting Tigers were able to pick up their first win of the season against Vision, only to subsequently lose to Devon 2 who have really enjoyed securing their place as a B-tour team this tour. The Brown and Burro Electro, in a fantastic match now look set to attempt a bid at A-tour for next season, while Birmingham have hopefully sealed a place at next tour. More to come! Remember to like, share and comment. DP @ tSG. Matthew Parker from Flump Open gives us their view of C Tour at London’s Calling. The first C tour of the season brought many exciting opportunities for competitors. 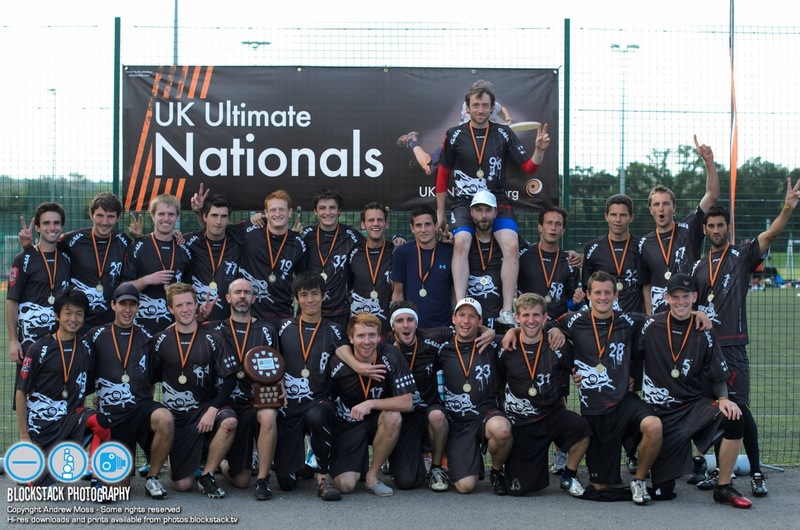 New teams with something to prove, seasoned teams looking to push into B tour, but all teams looking forward to a fantastic weekend of competitive ultimate unlike any other competition in the UK. With the largest C tour has ever been, and the inviting sun, London, was indeed, Calling. Complaints of seeding issues ruffled through the teams as the first day produced a collection of significant upsets, including the top seed Lemmings being toppled after a dominant display from newcomers Birmingham, who would prove to be a dominant force over the weekend. Flump also put on an excellent performance on the first day, conceding only 5 points in the group stage. Other seeding issues saw a reduced Yopen squad drop out of qualification after being dispatched by Mustard and an exceptionally close game against Rhubarb, who rose quickly up the seedings from the bottom half. As is consistent with C tour, the mix of standards saw relatively easy saturdays for the teams finishing top of their group, with dominant scores in their group. Flump Open take C tour by storm! Photo courtesy of David Gate. In an unfortunate scheduling issue, the finals were played immediately after the semis, however, this did not stop the players leaving everything out on the pitches and producing some fantastic ultimate. Shielded by the trees in the corner field, the wind became less of a factor, as beautiful overhead play through the Flump zone by Birmingham saw points trading at the start of the game. However, after the success of a few set plays and some fantastic use of hammers saw Flump take the half. Flump looked set to round of a weekend of dominant victories, however Birmingham did not drop their heads and pushed Flump to up their game and take C tour 15-9. From neighboring pitch, calls of “we’ll see you in B tour” resonated from Devon 2 after a victory over Mustard. 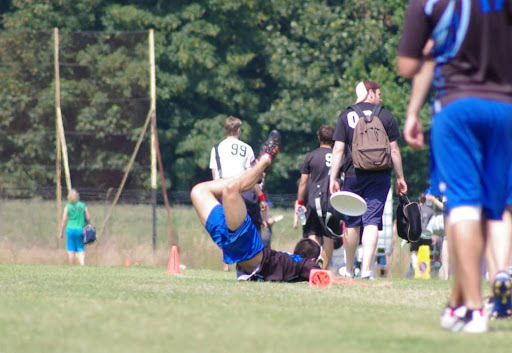 Overall, this exciting weekend, complete with sun, wind, and great ultimate, was a fantastic showcase for the improvement in the standard of UK Ultimate. 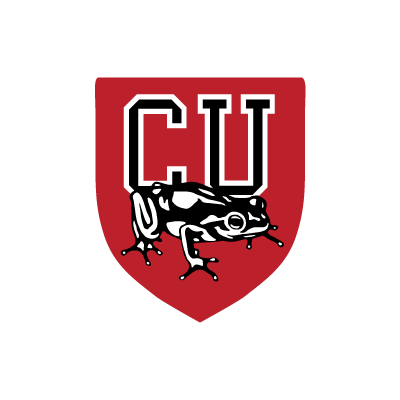 However, it seems that there is still an ever-persistent crevice in seedings for C tour, with the qualifying teams dispatching lower teams to cap with relative ease, meaning that their first truly competitive matches are not until well into the second day. Nevertheless, C tour will continue to serve as a fantastic, competitive platform for developing and recreational teams, and this tournament, especially at St Alban’s beautiful venue, will remain the highlight tournament of the year for many teams. Nice one! We have had Irish and C tour, tomorrow B tour. DP @ tSG remember to like, share and contribute!